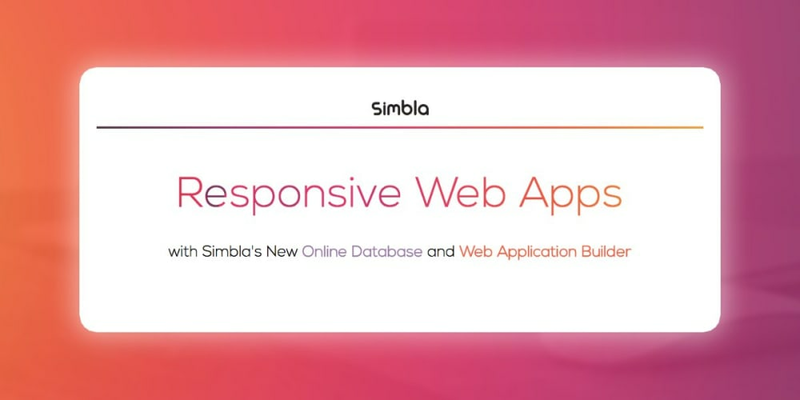 Simbla, that awesome website builder built on Bootstrap that we&apos;ve previously talked about here and here, recently came out with a new system to let you build database driven websites and applications with no code required. This means you can add a whole bunch of complex features to your website with almost zero-effort. Things like User Registration, Login/Logout buttons, site search, and much more. In this post, we&apos;ll cover the new features their online database provide. The way their new system works is an extension of their current website builder cloud based platform. It now allows you to manage your own online database. They achieved this by basing it on Facebook&apos;s Parse. As you can see, you still use their awesome responsive UI builder to construct your website. They now have an additional feature of drag and drop widgets that will allow you to connect your responsive UI builder to an online database. Before you can start using this the online database, you need to setup your database and connect it to your website. Simbla makes this process ridiculously easy. We&apos;ll demo this by following the guide in their docs where they create a basic "users" table, but you can do whatever you&apos;d like for your application. Through the dashboard, navigate to "Database" in your control panel. From here, just click "Create a New Database". Next, you just need to create your tables. Their documentation covers users, roles, and more. You can create as many as you would like. You can view, edit, and delete users with no confusion at all! Now that you have a basic database setup, it&apos;s time to explore the real power of Simbla&apos;s application system with their drag and drop widgets. Widgets are a custom drag-and-drop interface built by Simbla that lets you very quickly add complete custom functionality to your website. We&apos;ll do a quick overview of some of these. For a full list, make sure to check out the official documentation on Web Widgets! The registration widget adds registration to your website. It does this by providing the registration form and connecting it to your user table. Make sure to check out this working demo to see it in action. This is really neat because it allows to have permissions on your pages. The widget adds the login form and permissions. This widget is insanely powerful and probably my favorite! You can connect any custom form to a database. This is really useful for things like capturing additional information. Imagine it as your own little form builder. Imagine if you created a table for "Cars". In this table, you had over 50,000 different cars. Rather than having your users navigate for this, you could easily implement search functionality for them via this widget. Okay, so imagine if you wanted to show a page with pagination for those 50,000 cars instead of site search. Maybe just 6 at a time with pagination at the bottom. This is the widget for you. You can quickly showcase an entire database table in a responsive, interactive, UI/UX design. Make sure to check out the demo for Database Gallery too. This widget is great because it&apos;s likely the first steps for full ecommerce integration with Simbla (we hear is coming soon)! The final widget I wanted to share is the Charts widget. It&apos;s super powerful and easy-to-use. Quite the amazing development accomplishment from Simbla. This widget allows you to connect to any database table and display the data in interactive charts. Just check out this great demo to see it in action! Widgets are really cool for most people. You&apos;re on Scotch though, so you probably know your stuff! // Syntax to create a new subclass of Simbla.object. As you can see, the great people at Simbla have been hard at work adding an online database to their responsive website builder.